High-class architectural wire-cloth from HAVER & BOECKER was combined with newest Light-emitting Diode technology from Traxon Technologies - an Osram Business - to produce IMAGIC WEAVE®media facades. The end result is a robust, versatile LED system for an individually programmable video presentation of lighting effects in almost countless tints on facades. IMAGIC WEAVE® can help you display lighting and visual designs, going text or luminous high-resolution movie images in brilliant quality. The system is modular and may consequently be scaled to completely fit surfaces of any decoration. The desired contents are merely placed in standard file formats via a universal screen. 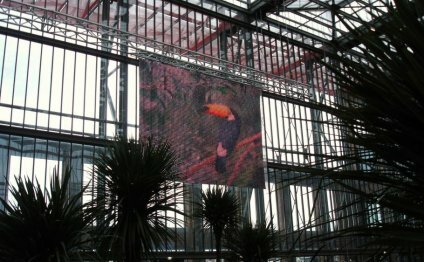 As opposed to non-transparent systems, the displayed pictures appear to be suspended straight as you're watching LED facade without concealing it entirely and that can become strikingly transparent, with regards to the ambient brightness. Also, the slim Light-emitting Diode pages tend to be attached to the line mesh in order that they tend to be barely noticeable when not in use and also have no influence on the looks regarding the facades themselves.